Pasquale Battista first appears in the Painesville, Ohio, area in 1901 when he became a naturalized citizen of the United States. 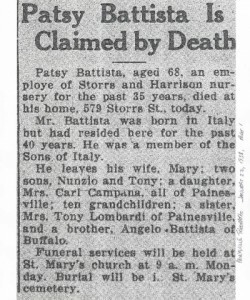 In America, Pasquale Battista was known as Patsy Battista. Pasquale Battista, son of Luigi Battista and Giuseppa Ciolf, was born on May 19, 1869, at Casalciprano, Italy. He married Maria Angela Fortunata about 1893 in Italy. 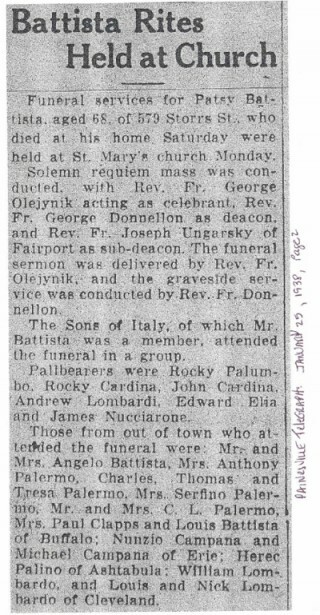 Pasquale died on January 22, 1938, at his home, 579 Storrs Street, Painesville, Lake County, Ohio, at age 68 of heart disease. His body was interred at St. Mary Cemetery at Painesville Township, Lake County, Ohio. Pasquale Battista, age 23, first immigrated to the United States on February 25, 1893. He is shown as re-entering the United States on April 6, 1898. Pasquale Battista established residence in Painesville, Ohio, about 1898. He became a citizen of the United States on December 4, 1901. 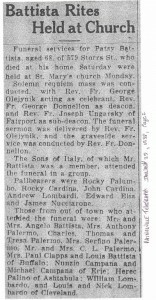 Pasquale’s wife, Maria, and three children, joined him in Painesville in 1907. 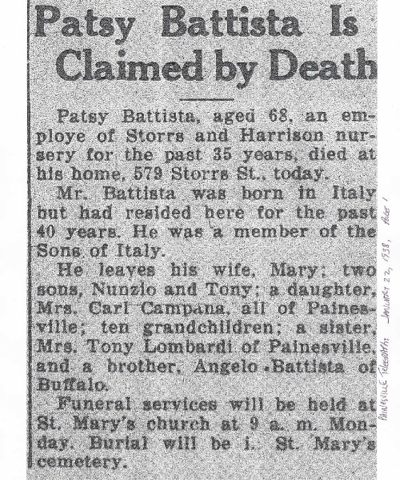 Pasquale Battista was employed by the Storrs and Harrison Nursery from 1903 until his death in 1938.